No comment on the first part - at least, for now. Twist can be locked with a sharp pointed screw. If you remove the hand support, you will see a hole in the handle. Use a screw to lock the twist. Make sure it is not too long and/or too thick, otherwise you can damage the cable inside the handle. Use short screw, just to press against the pole (axis tube) and avoid "screw" pole internal wires. I guess that ideally is a self tap screw with flat head. I was wondering what VKB is planning with the Bus port on the Black box, is it only going to be planned for the enhanced control panel. Or more extensions(like a pcb with headers on it so the user can configure his own panel)? 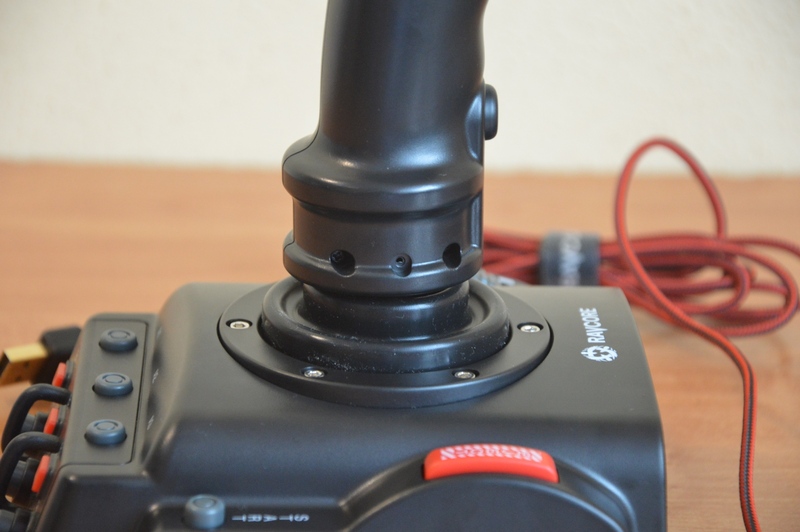 Is there any plan to add/remplace analog Mini-Stick with "linear transducer switch" - "Force sensor stick" - "Isometric joystick" in the future? Those thing would provide more range than a classic displacement Mini-Stick, and so more accuracy. Do you know a price for the force sensor stick? About 1000USD. on the left side, in the middle a trackball ball!!!!!!! What are, concretely, the options for those who live in European countries that are not part of the European Union? RedVonHammer wrote: What are, concretely, the options for those who live in European countries that are not part of the European Union? I should perhaps ask, What is it, concretely, that you mean by "options"? 1 - You save on shipment cost and time, and in case your country does not tax or vat internet purchases you will not be charged anything over "cost of goods + cost of delivery". If you are to be taxed, you will have to handle it yourself. You also get repair/support base that is nearer and better/faster accessible, as they are in your time zone. However, when the product you want to buy is new in the market, it takes longer time to see it in EU than in NA. Normally, a month or two longer. If you are in a hurry, then try 2 or 3. 2 - You sometimes save time, when VKB dealer in NA has stock, and VKB Global doesn't. However, you usually pay more for delivery, and will still have to handle tax/vat/whatever clearance yourself. 3 - If the only place where the product is in stock is VKB HQ, you would naturally want to buy from there. Same as 2, your shipment fee will be higher, and you will take care of the customs formalities. If my country had been a European Union member then yes that`be 10-4 affirmative, but you see, the only difference between me paying VAT or not, is that I pay 1/4th more and still have to declare contents, pay import taxes and clearances when the package reaches my country. I`ve tried ordering from VKB NA when they had Rev.B Gunfighters (KG12 grips) in stock recently but got a big ole`denied because my country was unavailable in the shipping options? I also tried emailing Rayner asking if he could ship internationally, and also emailed and asked Eduar on the matter, then as discussion progressed, if he could ship without adding VAT etc (since my country doesnt use VAT), but so far no answer from both of them on either question. That said I know I want a Gunfighter badly, and I`m no super-pro virtual pilot, so obviously I know these are highly desired products, Rayner and Eduard are both very very busy, to say the least! Didnt want to bring it up but Eduard is a bit slower on getting products in as well, compared to NA/RU/AS, which I`m sure is more than likely due to EU rules, laws and regulations. So yes, getting the product faster, when there are already months of waiting time (not Eduard`s fault), is certainly a factor. That`s explicitly more the reasons and circumstances why I decided to ask here instead about options for people like me (and, well, me ) rather than busying Ed and Rayner, seeing how busy they are. Again, I`m not against VKB Europe or anything, Eduard is doing his best to cater to EU customers and that complicated market, of course I have nothing against that, in fact I applaud the man! Hello, another new member here. I had a question about supply. The website says that the Gunfighter MK2 MCG will be available after January 15th, and isn't even up for preorder yet; claiming that it is out of stock. On the other hand, the Gunfighter MK2 base and the MCG Pro grip are available separately for pre-order, and do not seem to be out of stock. Is there any difference in preordering the base and the grip separately compared to buying the whole kit? Will I be able to buy the Gunfighter MK2 MCG kit after January 15th, or is stock of the full kit completely out at this point and preorders are closed? I`ll be specifying my question to cover all bases. Been waiting for reply from Rayner on shipping but nothing so far. Is there a way to add shipping outside the listed countries in the store or is it a case by case thing that has to be reviewed per email? Hardly possible to answer anything as we don't even know which county you are in. Auditor wrote: Is there any difference in preordering the base and the grip separately compared to buying the whole kit? Yes there is although not big; it is all about firmware-related things. My mistake, I'm in the eastern U.S. Will I have to worry about supply issues? Also, are these firmware differences rectifiable on my own? Auditor wrote: I'm in the eastern U.S. Will I have to worry about supply issues?